Four antiquities returned from the Metropolitan Museum of Art in New York are on display in Rome. 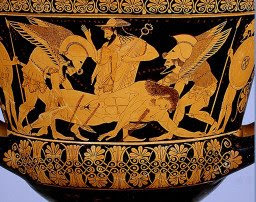 However the Sarpedon krater is now in an exhbition, "La Forza del Bello", in the Palazzo Te, Mantua ("Ancient Greek art dazzles Mantua", ANSA, March 31, 2008). The exhibition also features a small ''bonus'' section at the end, showcasing three masterpieces that US museums have recently returned to Italy after lengthy negotiations. These include a marble ceremonial basin decorated with Nereids and a striking painted marble sculpture of griffons attacking a doe, both returned from the J. Paul Getty Museum in Los Angeles. The third piece - returned from New York's Metropolitan Museum this January after decades of discussions - is a terracotta drinking cup [sic.] painted by the 5th-century BC Greek master Euphronios.